Rather than having an all-in-one solution like the NVIDIA Shield, which brings together the console, controller, and display into one gadget, the Mad Catz MOJO Android Micro-Console is a two-part system. At the heart of it all is the micro console, which houses the brains and guts that are needed to run some of the most cutting-edge and demanding games for mobile – albeit, the specs of the unit itself is still largely unknown. Regardless of that, it’s touted as being one of the most powerful Android gaming consoles, so we can rest easy knowing that it’ll be outfitted with some serious gear. In the rear of this pocket sized console, it houses all the ports necessary to bring gaming to any display or HD television set – it consists of 2 full-sized USB ports, 3.5mm headset jack, power port, microUSB port, microSD card slot, and a HDMI port. Complementing the console is the Mad Catz CTRLR gaming pad, which employs the distinct button layout of the XBOX 360’s gaming controller. This Bluetooth enabled can be used to work with any Android device out there, which adds to its depth, but it’s mainly used to play nicely with the micro console. As for the build quality and construction, it’s pretty much on par to Mad Catz’s normal arsenal of gaming pads for consoles – though, it’s super glossy and tends to show smudges and fingerprints. Now, what separates the Mad Catz MOJO Android Micro-Console is that it doesn’t have a closed experience like other comparable offerings, but rather, it sticks to providing users with an open Android experience. Basically, you’re not limited to certain titles that would normally be deemed as “compatible” to work, but rather, you can start playing your existing titles – no fees, subscriptions, or special versions of games needed. Needless to say, it’ll be interesting to see how things pan out for this, but we’re still in the early stages of its development, seeing that specs, pricing, and an exact release date have yet to be confirmed. 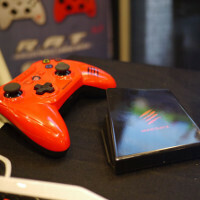 Still, it’s enticing enough considering that Mad Catz is serious about making it as the most powerful Android console when it launches sometime this upcoming holiday season. With all of these coming out I'm not sure which to get. I like this one not needing "compatible" games its looking like this one. Because really I just was one of these to run emulators. If the game stick can do that, that's the one im most excited for. Im liking the Madcatz over the Ouya myself at the moment. Im sure the specs will be more powerful, plus it supports Google Play and expandable memory, 2 things the Ouya does not. I wont be surprised if this costs more given that they are going to make money only off the hardware, but as long as its not a ridiculous amount more I'd get it. I'm already sold on this vs Ouya. Madcatz have been in the gaming business for a very, very long time as a peripheral maker. But just like the Asus Eee Pad MeMO ME370T which is now the Nexus 7 Google should court Madcatz to make the console and Google should worry about the software. Okay, so the title says Micro-Console hands on, but I only see hands on the controller. Where is the hands-on with the console? Absolutely crushes Ouya because of the single elementary thing - google play support. Only thing left now is the standardized Android key API layout. This is a huge gaming opporrunity.. ideal present for your kid or nephew.